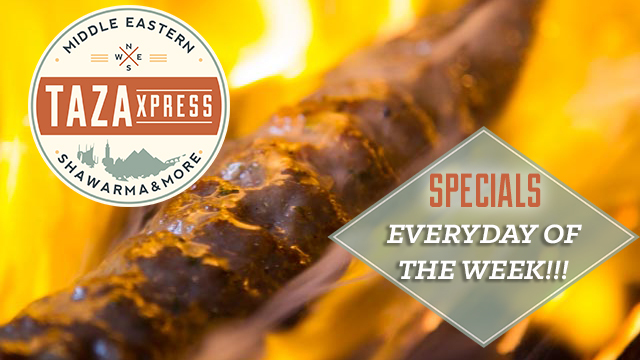 With FOUR locations to serve you, we guarantee you Xpress service! our taza lentil soup is a true taste of home, cooked and prepared daily for a fresh taste. Our lentil soup is a must-try. It's a true taste of home! Our chicken on z'rocks ... yummm! Chicken breast marinated thin slices, seasoned with our secret recipe, grilled to perfection. AAA beef thin slices, seasoned with our secret recipe, grilled to perfection. Our grilled chicken shawarma served on a bed of fries topped with our favorite taza sauces. Our grilled beef shawarma served on a bed of fries topped with our favorite taza sauces. our AAA beef liver seasoned, sautéd with fresh peppers, onions, and olives topped with our favorite taza sauces. our AAA beef sausage seasoned. sautéd with fresh peppers, onions, and olives topped with our favorite taza sauces. Taza fries with cheese. You haven't had anything like it! Minced ground beef mixed with parsley, onions, and our secret spices, grilled to perfection. Grounded fava beans, hummus, parsley and onions fried in vegetable oil. AAA beef thin slices seasoned, grilled with onions, peppers and melted cheese. our AAA beef sausage seasoned, sautéd with fresh peppers, onions, and olives topped with our favorite taza sauces. Our Falalfel is %100 vegeterian and fried in vegetable oil. It is a vegetarian delicacy with an exquisite taste! AAA beef marinated thin slices, seasoned with our secret recipe, grilled to perfection. Chicken breast marinated cubes, seasoned with our secret recipe, grilled to perfection. 1 skewer of Kofta, 1 skewer of Tawook, Beef shawarma, & Chicken shawarma. Grounded fava beans, hummus, parsley, and onions fried in vegetable oil and served with salad & regular side. Our AAA beef liver seasoned, sautéd with fresh peppers, onions, and olives, served with salad, and your choice of rice or fries. Our AAA beef sausage seasoned, sautéd with fresh peppers, onions, and olives, served with salad, and your choice of rice or fries. Authentic Alexandrian AAA beef liver & sausage. Your taste buds are in for a treat! If you have already tried our food, we welcome your feedback. Please feel free to leave a note here or check us out on Facebook, twitter and instagram. We welcome all your comments and we promise to do our best to consider all suggestions or recommendations.